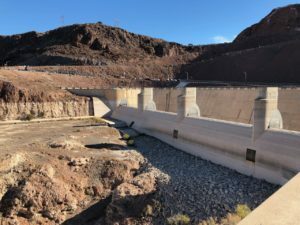 By the numbers, Lake Mead began 2019 at elevation 1,081.47 feet above sea level, down a foot in 2018. This comes in spite of yet another Upper Basin release of 9 million acre feet from Glen Canyon Dam last year, an extra 770,000 acre feet above the 8.23 million acre feet the Lower Basin can rightly expect under the Law of the River. Since 2000, the Upper Basin has delivered an excess of 9.8 million acre feet from Glen Canyon Dam above and beyond the 8.23 million acre feet expected every year under the current interpretation of the Law of the River. In that time, the level of Lake Mead has declined 115 feet. In the 21st century, water users in the Lower Basin have received 9.8 million acre feet of bonus water, above and beyond their legal expectation under the Law of the River. This is not about climate change or drought. This is about using too much water. Eric Kuhn and I are in the finishing stages of a new book looking at the history of our understanding of the hydrology of the Colorado River – what we knew about how much water the river really has, and how that knowledge shaped river management institutions. I don’t want to give away too much here (Buy our book! As soon as it’s published! ), but our reading of the history makes clear that this situation was essentially known or knowable a century ago. Over the winter break, in clarifying some of the book’s final bits, I’ve revisited John Wesley Powell’s Report on the Lands of the Arid Region. As the historian Sara Porterfield pointed out at last year’s Colorado Mesa University Upper Basin Forum (a bit of her argument here), Powell hagiography has become an intellectual crutch, but he’s nevertheless a good guide. In the 1878 introduction to the first edition of Arid Lands, Powell talked about the crucial interplay between three things: descriptive science (How much water is there? ), engineering (What kind of stuff can we build to use the water? ), and institutions (What kind of rules do we need to govern the cooperative enterprise needed to pull this off?). He and others of the day I’ve been reading use a funky old word that I like to describe what is needed – “prevision”. By this they mean a sort of foresight, a prognostication. “[A] wise prevision, embodied in carefully considered legislation, is necessary,” Powell wrote. This is the bit that isn’t working so well. If you look at the math, it was abundantly clear by 2000 that, as Terry Fulp noted in a passage in my last book, “Lake Mead will go down.” (You can go ahead and buy it now, or wait until March it’s coming out in paperback.) Our “prevision” hasn’t been so great.